Google’s Pixel 3 event today didn’t bring too many surprises on the hardware front: most had been leaked well in advance of the presentation. What caught my eye was not a device but a new a new software feature called “Live Albums”. Dave Loxton, Google Photo Product Manager, explains, “Many of us share the same photos with the same people over and over, whether it’s photos of your children to their grandparents, or cute pics of your pup to your best friend. Every time, we have to find the photos, select the ones we want to share and send them to the right people. And that’s if we even remember to share them at all. Live albums start out as ordinary albums – you select the special photos of friends, family and pets. 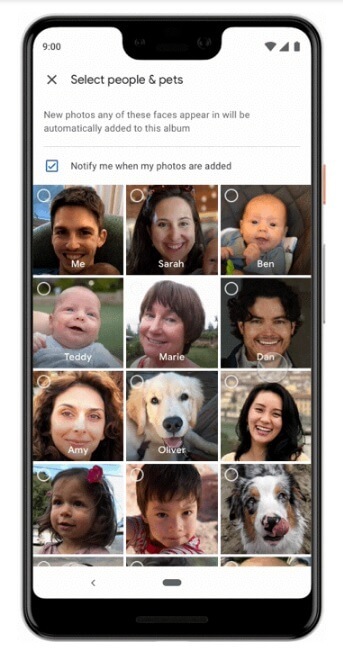 Here’s the clever bit…once tagged as a live album, freshly taken photos will be scanned by Google’s AI smarts and if they include people in the live album, they’ll be added into the album automatically. This is fantastic for those families wanting to share photos with far-flung relatives. Instead of constantly having to remember to send photos to granny in Edinburgh, create a live album of the grandchildren and share it with her. New photos of the children will be added in as they’re taken, and granny gets to see the photos straightaway. Google touts its Home Hub as being the ideal picture frame to display live album, though it’s only 7″, which I think is a little small for a photo frame. Priced at US$149 or UK£139, the Home Hub is competitively priced against wireless photo frames from the likes of Nixplay. I can see the Home Hub taking market share this Christmas. The updated version of Photos with live album support will be rolling out shortly, so wait for it to appear on your smartphone.